This large bug, some 25mm long, was found feeding upon mesquite pods in French Creek Canyon, Bradshaw Mts., Yavapai Co., Arizona, USA. May 2009. Many leaf-footed bugs have an expanded, flag-like process on the third pair of legs; in this genus the hind leg femur is simply thickened and slightly flared, more so in the males than the females. The immature stage is similarly shaped but lacks developed wings and is usu. greenish in color. At least a couple of Mozena species are found in Arizona. The pronotum has a lateral pair of sharp, curved processes. 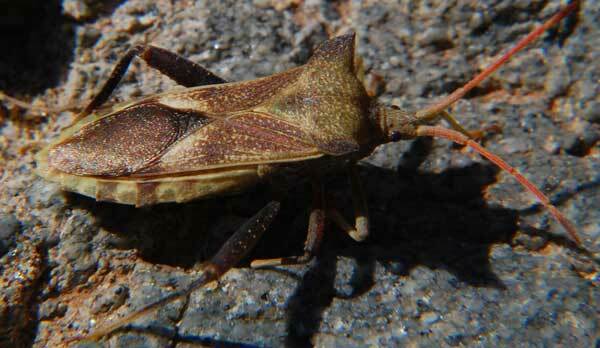 Leaf-footed bugs can produce foul-smelling, repellant chemicals if attacked or disturbed. A long proboscis is used to pierce into fruits and feed upon the developing seeds and reducing their viability. Mozena bugs are commonly encountered in the Sonoran Desert on Velvet Mesquite when developing seed pods are present, mid spring through summer. Mesquite has been transported to other parts of the world and planted for ornamental and other reasons only to later escape cultivation and become an invasive weed. These bugs have therefore been investigated as possible biological control agents. 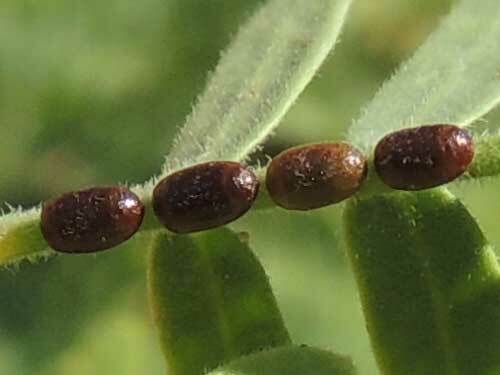 The eggs are affixed in straight rows, in this case on a leaf rachis of mesquite. Each is just a bit longer than 1mm. Yavapai Co., Arizona, USA. June 2012.